Vonia: Total 80's Bone Conduction Music Headband | OhGizmo! If you’re the type to work out with a headband on, you’re probably also the type who likes glam rock and power ballads… It’s all about the hair, man. Mercifully, the Thanko Vonia headband uses bone conduction to project Bon Jovi directly into your skull, sparing those around you. 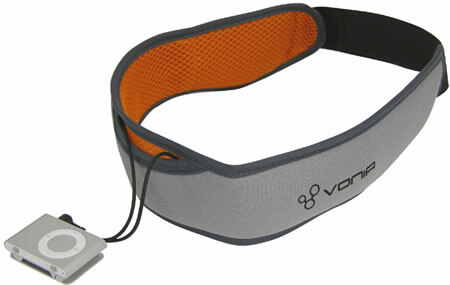 The Vonia is sweatproof and has a handy little iPod Shuffle-sized pocket in the front. I’ll admit to having never used bone conduction headphones, but I can’t imagine that it’s much different than the music that I hear inside my head anyway… Weaker bass, I’m sure. And probably less mutterings about how I should sell my roommate’s car on eBay and buy that DSLR I’ve always wanted. Available now in Japan for about $85. What is wrong with Glam Rock and Power Ballads? didnt u read the wikipedia? it naturally accentuates the bass!